Lyrical Letters has some really neat sayings on it! This saying is on the LL cart and I just kept wanting to use it. I decided to make a card for m y Goddaughter has started her freshman year at OSU. I am going to try and send her a card each week. I remember going away for college and even though I was only 45 minutes from home it always felt great to go to my little mail box and have a little note or card from someone. The paper is K & Comapny Chocolate, or was that Chocolait...one or the other. I used stickles on the vine swirls. The flowers are layered and are from Michaels in the wedding department. I used a few skittles for embellies. 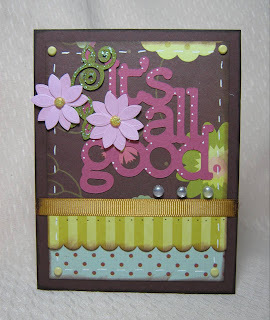 I used the Stampin Up scallop border punch also. The flower centers are some brads that I used doodlebug glitter on. The only thing I don't like about Lyrical Letters is that there isn't a shadow feature. I LOVE SHADOWS!! nice card. I totally agree with the shadow thing! Cute card and I'm right there with ya - I always feel like it's not totally complete without the shadow! Very cute! I like the ink on the scallop. Why can't you just stretch your saying using your little handles in DS and make your own shadow? Seems like "someone" taught me how to do that about a year ago! LOL! I love al the cards you made recently, they look so great. wel done. what a cute card and great saying too! just love the colors too! hugs! Want to win Winter Woodland? Want to win a Gypsy?